Creed Perfects the Art of the Man-Cry, But Will Oscar Voters Feel It, Too? Has your dad emailed you yet to tell you how much he cried while watching Creed? Is your social-media timeline flooded with man-tears now that the well-reviewed Rocky reboot has opened? Hollywood hasn’t delivered a bona fide male weepie like this one in a long time, and that’s surprising, given how well those films often do with general audiences and Oscar voters. The most recent male weepie of note may be Good Will Hunting, which climaxed with a cathartic cry and went on to earn nine Oscar nominations. 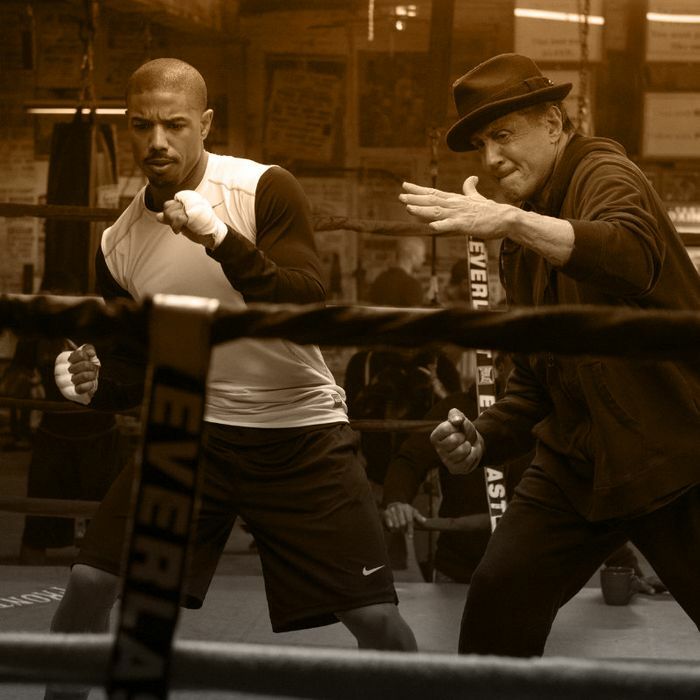 Can Creed, which is superficially similar to Matt Damon’s 1997 drama, manage the same feat? Let’s do a rundown of the categories where this boxing blockbuster could compete. One of Good Will Hunting’s two Oscar wins came when Robin Williams triumphed in the Best Supporting Actor category, and Creed’s Sylvester Stallone is well positioned to do the same. This is the very definition of a comeback performance, and Stallone wrings an entire bucket of man-tears from a mid-movie monologue about coming to the end of his life. Stallone has not been Oscar-nominated since the original Rocky came out almost four decades ago, and while the film won Best Picture, Stallone’s two campaigns for Best Actor and Best Original Screenplay came to naught. What better way to even the score than by giving him the gold for Creed? Still, this isn’t necessarily smooth sailing for Stallone: As BuzzFeed’s Kate Aurthur pointed out on Twitter, the actor isn’t beloved by everyone in the industry, and voters don’t give trophies to people they don’t like. Another actor with a comeback bid, Burt Reynolds, found that out the hard way when his bad reputation sunk a Boogie Nights bid that lost to … well, Robin Williams, for Good Will Hunting. Minnie Driver managed a Best Supporting Actress nomination for playing the love interest in that film, and I wonder whether Creed’s Tessa Thompson can do the same. Like Driver, she’s been cast as the girlfriend of an emotionally volatile dude with foster-care scars who’s hiding a secret skill (I told you these films were similar! ); also, like Driver, Thompson imbues her character with so much inner life and loveliness that she pops off the screen and transcends what could have been a stock role. Much has been made of how few actresses of color are in Oscar contention this year, but a Creed wave could help sweep the talented Thompson in, especially if Oscar voters open up the category by rejecting the two lead actresses trying to finagle a supporting nod, Carol’s Rooney Mara and The Danish Girl’s Alicia Vikander. At the very least, if actresses like Room’s Joan Allen can be perceived as contenders simply for being in a movie that will receive many Oscar nominations, Thompson ought to get the same consideration. Can Michael B. Jordan crack Best Actor? Matt Damon managed it for Good Will Hunting, but as the co-writer of that film’s Oscar-winning screenplay, he gave himself two very tasty, emotional scenes near the end of the film (I’m thinking of the bedroom fight with Minnie Driver and, of course, the “It’s not your fault” sequence). In the back half of Creed, though, it’s Stallone who gets most of those moments, and the most affecting bit that Jordan has — a simple, sad thing he tells Stallone during the final fight — goes by in a flash. Make no mistake: This is a physically persuasive performance that will go a long way toward making Jordan a big movie star, and it will likely give him the franchise that Fantastic Four failed to deliver. Oscar attention, though, may prove more elusive, unless enough voters see this nod as a make-good for snubbing Jordan’s even-better Fruitvale Station performance two years ago. Out of all the below-the-line categories, the one I’d most like to see Creed nominated in is Best Original Score. Young Swedish composer Ludwig Göransson managed something rousing and exciting, and his score is a great blend of new techniques and old-school composition with an irresistible lift from Bill Conti’s best-known Rocky cue. A nod for Best Cinematography would be a major coup for Creed: No woman has ever been nominated in this category, and Maryse Alberti would be the first. Can Creed pick up some Best Sound nods? Some boxing movies do (like Raging Bull), but some don’t (like The Fighter, which earned a ton of Oscar nominations but none in sound categories). A Best Film Editing nomination may be a better bet, if the movie continues to over-perform. The tricky thing about a script nod is that sequels are automatically consigned to the incredibly competitive Best Adapted Screenplay category, where Creed’s Ryan Coogler and Aaron Covington will be going up against Oscar winners like Aaron Sorkin and Charlie Kaufman. Two sequels have been nominated here in the past decade — Toy Story 3 and Before Midnight — but neither of those films had the task of resurrecting a series that has already seen six installments. Still, if the movie cracks the Best Picture race, and I’m betting it will, that will raise its chances in other categories, including Best Director, which ought to include Coogler. Only three black people have ever been nominated for that prize, and two of those came in the last six years. Let’s make Coogler the formidable fourth, and keep those happy tears coming.